Blinds and shades add beauty to your home or business! Mike from BlindsOnLine.com has been in advising customers about decorating windows for over 30 years. Mike is an established expert on window coverings and window treatments. Mike’s brick and mortar business includes consulting with customers to identify their decorating style and tastes so he can recommend the best window treatments to add beauty and functionality to the home or office. Considerations such and light control, privacy, cost, ease of operation and function are some of the things that help determine the best window coverings for a particular installation. 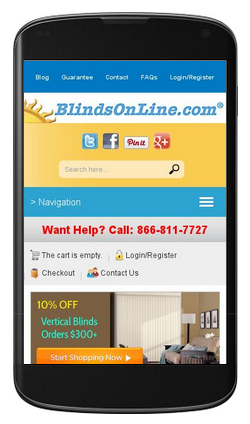 Mike offers free advice on window decorating, window treatment repair and maintenance via his online blinds store; www.BlindsOnLine.com which originally opened for business in 1998 and then relaunched in 2007 with many updated iterations since then. The current design of BlindsOnLine.com underwent a major makeover in 2013 and in 2015 it was updated again to be a desktop and mobile friendly blinds & shades store. Stop by often and check our weekly specials. Use Blindsonline.com coupon codes to save money! Looking for advice on blinds to install on the inside of a wall of new windows on an enclosed lanai in a Florida home. Windows are tall thin bi-pass double panels, sliding horizontally. Approximate width of each window is 4′ wide x 4′ high, with two sliding panels per window. What kinds of blind would you recommend for the inside, primarily to provide privacy, but also allowing the windows to be opened for effective cross-ventilation? Solar screen roller shade would allow air flow and provide privacy when needed. They are available in 3 different “openness” percentages, each providing varying degrees of privacy.